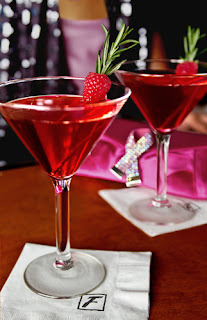 During the month of October, Fleming’s Prime Steakhouse & Wine Bar is urging everyone to “Drink Pink For The Cause!” by indulging in its new specially created cocktail, the Stoli Bombshell. During the month of October, 100% of the sales for each Stoli Bombshell will benefit the Avon Breast Cancer Crusade, which supports finding a cure for breast cancer and advancing access to care for all, regardless of one’s ability to pay. The Stoli Bombshell is served nightly for $6 in Fleming’s Bar and Main Dining Room at two Chicago area locations: 25 E. Ohio St., Chicago, and 960 Milwaukee Ave., Lincolnshire. At only 99 calories, the Stoli Bombshell luxuriously combines Stoli Vanil vodka, fresh raspberries, raspberry preserves and freshly squeezed lime juice, served straight up in a martini glass. The Avon Breast Cancer Crusade was launched in 1992 as a small pioneering program in the U.K. Avon in the U.S. adopted the Crusade the following year. Over the last 17 years, Avon philanthropy has raised and donated more than $640 million to breast cancer programs around the world, supporting cutting-edge research to find a cure for or prevent breast cancer as well as programs that enable all patients to access quality care. Funding supports awareness and education: screening and diagnosis; access to treatment; support services; and scientific research. Beneficiaries of the Avon Breast Cancer Crusade range from leading cancer research and clinical centers to community-based, non-profit breast health education programs. The nationally acclaimed Fleming’s Prime Steakhouse & Wine Bar offers the best in steakhouse dining – prime meats and chops, fresh fish and poultry, generous salads and side orders—with a unique wine list that features 100 wines served by the glass. Fleming’s is the recipient of numerous prestigious awards, including Wine Spectator magazine’s annual Awards of Excellence, and Wine Enthusiast’s annual Awards of Distinction.